Dreaming of the perfect outdoor living space can bring up a lot of stress if you don’t know what would work best for your house. With each different aspect of a patio comes 20 more questions that bring along more options than you could dream of. Options are great when you know exactly what you want. But when you do not have everything figured out things can get tricky. Sometimes you just have to take a step back and figure out a few simple things when starting your journey for that picture-perfect patio. It’s time to talk patio design. Most outdoor living spaces will be off of the kitchen because that’s where most people tend to frequently travel. Or there is always the option to have a getaway patio that embraces that scenic view that you just can’t get from your window. Sizing depends on how many people you plan on accommodating for. Do you want to have your whole family over for a BBQ? Or is it a space for you to just simply enjoy the evening sunset with a few friends? Different patio purposes require different necessities. 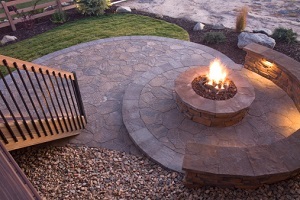 Fire Pit: A centerpiece for spring, summer, and fall for relaxing and enjoying the fire. Grill/Pizza Oven: Cooking outside lets you be at two places at once; the kitchen and the great outdoors. Statues: Art, a statement piece or maybe just something to start a discussion with your guests about. Lighting: Gives you the light you need to spend all evening outside. Water Fountain: The sound of water trickling can be just the right amount of Zen for your outdoor oasis. The best way to make the features grab the attention they deserve is by having landscaping surrounding them. You want the entire space to flow collectively into one outdoor living space. By continuing the landscaping the entirety will fit together perfectly. Patios also act as a great anchor point for further expanding an outdoor place. Taking advantage of additional hardscaping such as retaining walls and walkways can bring aspects to your outdoor living space that nothing else can. Stone pathways give your outdoor living space an upgraded look that other materials do not offer. Their durability can withstand the test of weather, animals, and those “Just Because It’s Summer” parties. Hardscaping and stone work are functional and intriguing to the eye: the best of both worlds. Your out door living space is a reflection of you and your home. The best thing you can do is plan. Design how you picture it with colors, aromas, and lighting. Plan out what you want to use in this space. Making these decisions can cut down on future confusion that will just waste time and add to your stress. Professionals at Greener Horizon are ready to assist you with your patio and landscaping desires. Let us know how we can help.